Understanding & Appreciating the Female Perspective! This DVD comes in a neatly presented cover which provides very little detail, not even the running time. It certainly provides no clue that this is simply a recording of one of Tony Attwood's speeches at a conference. After the initial shock of realisation that this is a conference video, things take a little while to settle down. The first ten minutes are almost unbearable as the camera has been placed at the back of the conference room and it's clear that the operators don't know how to zoom it. In fact, quite apart from the heads bobbing around at the bottom of the frame and the grainyness of the picture, distorted sound and a few nasty bumps, you can see couple of attempts to zoom the camera. Fortunately, after 10 minutes, they get it right and they zoom into a clear head and shoulders frame of Tony as he gives his speech. Strangely, it's around this point that they get the audio right too. Things go along fine until about 50 minutes when some wag decides to pull the camera out to get a profile shot of Tony, distorting both the picture and sound at the same time (and worse than at the start) for a full five minutes. Luckily, this only lasts for five minutes and then the camera returns to normal and the cameraman leaves it alone for the rest of the film. I get the feeling that he was told to "go sit in a corner". Camera issues aside, Tony Attwood is a magnificient and engaging speaker who talks about his subject with a passion. He covers quite a bit of ground in 90 minutes and is helped by powerpoint slides with quotations from famous females with Aspergers Syndrome and other ASDs. Aside from the 15 minutes of distortion, Tony's voice is clear at all times though the absence of subtitles is criminal - they're not that difficult to make and would have added a lot to the DVD especially given that so many people on the spectrum have difficulty interpreting speech. Luckily, the fact that many sections of the DVD are direct quotes from powerpoint slides (which are shown on the screen) helps. If you have any hearing issues, you can at least, read along with Tony. 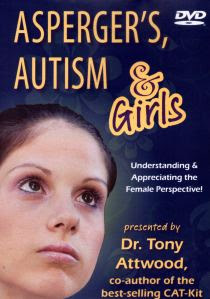 If you can't make it to any of Tony's conferences and you have a daughter or female student on the spectrum, then this DVD is certainly the next best thing. It's also a great thing to have handy for repeat value as your child grows up. I had a bit of a laugh in places where it hit too close to home - it seems that male and female aspies aren't all that different after all. If you're not much of a reader, then this DVD will save you the trouble of reading books about females with aspergers. Tony's coverage of the topic is comprehensive and he talks about all aspects from growing up, to exploring their feelings, to bullying and to dealing with boys. It's truly the sort of video that the parent of a girl with aspergers will want to refer to time and time again. Given that there's not really much action in the video, it isn't really something that needs to be seen. It could just as easily be listened to as an audio only experience. This is good because it means that you could listen to it in the car or the kitchen without missing out on anything. I'd recommend this DVD to all parents and teachers of females with Aspergers Syndrome or other Autism Spectrum Disorders. If you are an adult female with aspergers, the video is probably not going to tell you a lot that you don't already know about yourself but it might clarify a few things. If you're a female child with aspergers however, it's a different story. This video is going to help you to understand yourself and why people react the way they do around you. Aspergers, Autism and Girls: Understanding & Appreciating the Female Perspective is available from Future Horizons publishing. Honesty Clause: I was provided with a review copy of this DVD free of charge. Tony is an EXCELLENT speaker, and I strongly recommend going to one of his conferences if at all possible. Thank you for your honest review of this DVD. I certainly won't be getting it because I have a profound hearing loss and Need Subtitles! What a bummer, considering the cost of this DVD.